Buying new stuff makes you feel good. That’s just science. It’s about endorphins…or something. And when it comes to tech, there’s nothing newer or more impressive to buy right now than the Samsung Galaxy S10 that was launched to much pomp and circumstance on Wednesday. If you simply want to know what the best tariffs out there are, then we’ll point you in the direction of our dedicated Galaxy S10 deals page. Or if you want to know where to buy the handset outright, our Samsung S10 SIM-free price page will cater to those needs. It can be quite bewildering seeing all those offers from different retailers. Everybody seems to have an angle on why they are the best place to order your new S10. So if you’re somebody who loves an added perk with their purchase, then we’ve collated the most eye-catching special offers here. Keep reading to see what’s out there and start preparing for that endorphin rush. If you land on a retailer’s website or walk past a shop and get a little excited by their free Galaxy Buds offer, just take a moment before you buy. Every retailer and network is throwing in the wireless earphones worth £139 with contract and handset purchases in the pre-order stage. So be sure to consult our Galaxy S10 deals page first to make sure you’re getting the best price. If you know what you want – and that’s buying the Galaxy S10 outright – then we’d suggest doing so direct from Samsung. No retailer before March 7 is going to undercut it, so you get the warm, cuddly feeling of buying direct from the manufacturer. But better than that, Samsung’s trade-in offer means you could see a return of up to £350 on your old phone. That’s a great saving on an admittedly pricey new smartphone. And don’t forget to check out our best SIM only deals page once you’ve ordered. 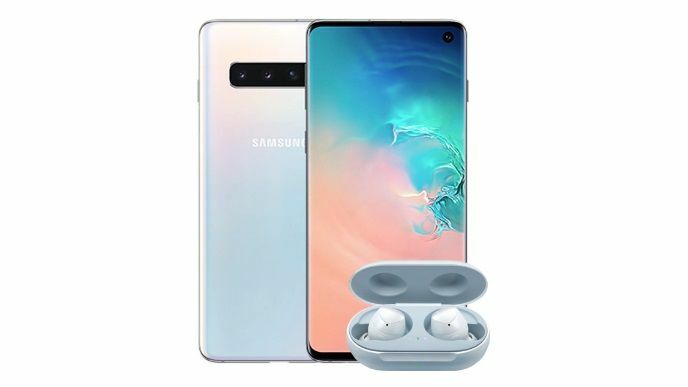 Unsurprisingly, Mobiles.co.uk has come up with some of our favourite Samsung Galaxy S10 deals out there. Take a look at our main prices page as referred to above, and you’ll see them as our early Editor’s Pick. But buying from Mobiles gets even better when you consider that all pre-order purchases will automatically enter you into a prize draw for a £1,000 Currys/PC World voucher. So well worth a look. Retailers like Affordable Mobiles and Mobile Phones Direct love their cashback offers. Their special super power is to come in with relatively decent tariffs and then offer ludicrous cashback sums that undercut the competition. We’ve seen S10 tariff with as much as £396 to claim back over five instalments during the life of the two year contract from these retailers. So click the links above and get stuck in. iD Mobile is the budget network from UK retailer Carphone Warehouse. It’s renowned for offering bargain bills on low data tariffs. There’s no change to that here, other than it is also offering a mega 50GB data boost for all pre-order contract sign ups. You can use that as and when you need it over the next two years for months when you use more data than your usual allowance, making iD Mobile S10 plans even better value this time around. There’s still only one major network out there that offers absolutely unlimited data with its contract phone plans. No prizes for knowing that Three is the network in question. It doesn’t come cheap in the early stages, but by pledging £29 upfront and then £65 per month, all of that infinite data can be yours on the Galaxy S10.